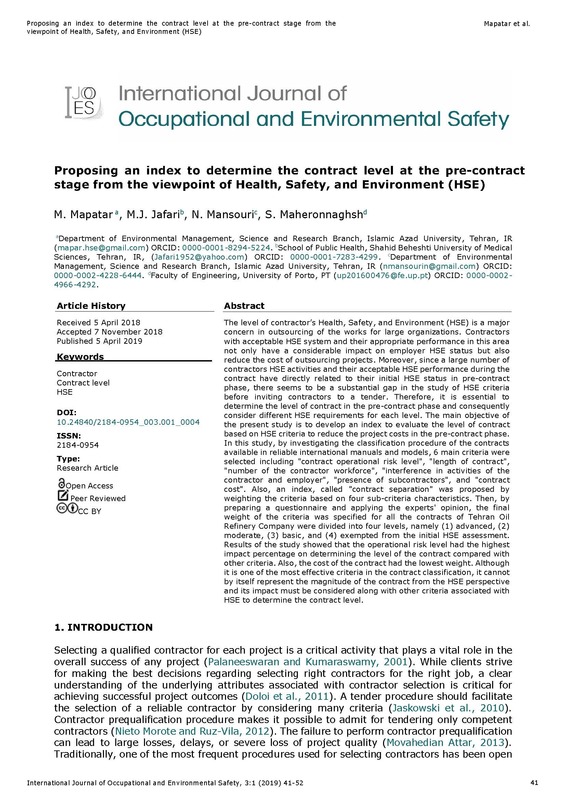 The International Journal of Occupational and Environmental Safety (IJOOES) is an interdisciplinary journal with peer-review promoted by Sociedade Portuguesa de Segurança e Higiene Ocupacionais with support from Biblioteca da FEUP, for publication of original research. Literature review articles are also accepted. 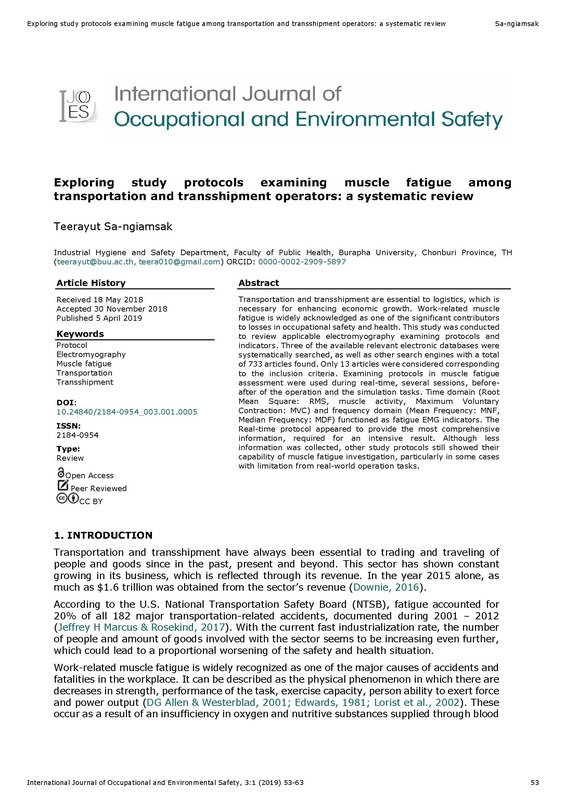 It covers basic and applied research in all areas of safety, industrial hygiene, ergonomics, biomechanics and health, including traffic, workplaces, home, and community. IJOOES seeks to engage the global scientific community including academic researchers, safety professionals and practitioners, engineers, health professionals, psychologists, social scientists, government agencies, policy makers and corporate decision makers. We are now announcing two special issues for this year! 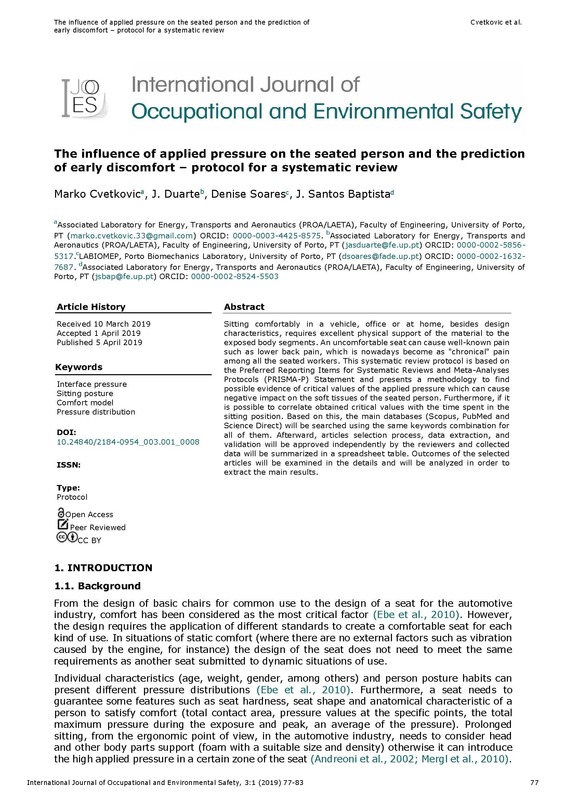 Do you have a paper you would like to submit? Do it now in our submissions section! We are NOW accepting submissions for our Issue 4! 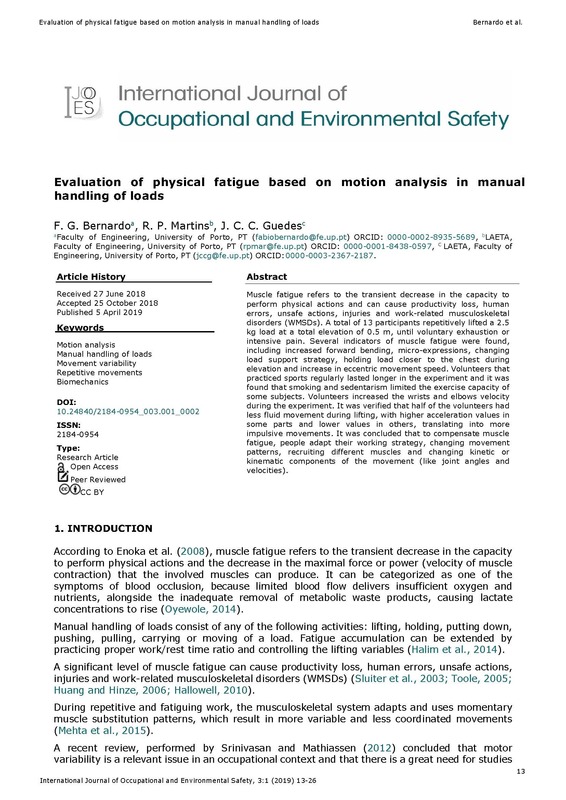 Even in sedentary activities, the workload is justifying more accurate studies about its impact on human beings mainly when related to different temperature and humidity conditions. One of these impacts is related to mental activity, which can be studied by the amplitude of Alpha and Beta waves. 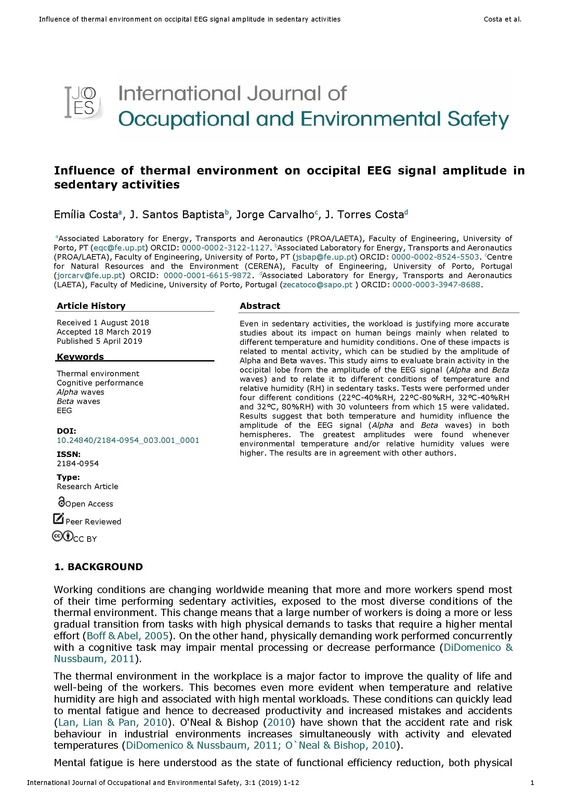 This study aims to evaluate brain activity in the occipital lobe from the amplitude of the EEG signal (Alpha and Beta waves) and to relate it to different conditions of temperature and relative humidity (RH) in sedentary tasks. Tests were performed under four different conditions (22°C-40%RH, 22°C-80%RH, 32°C-40%RH and 32°C, 80%RH) with 30 volunteers from which 15 were validated. Results suggest that both temperature and humidity influence the amplitude of the EEG signal (Alpha and Beta waves) in both hemispheres. The greatest amplitudes were found whenever environmental temperature and/or relative humidity values were higher. The results are in agreement with other authors. 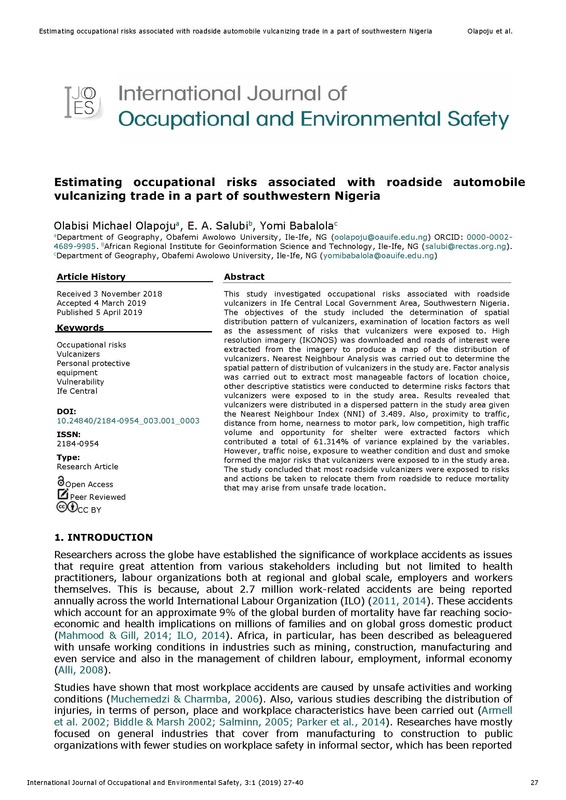 This study investigated occupational risks associated with roadside vulcanizers in Ife Central Local Government Area, Southwestern Nigeria. The objectives of the study included the determination of spatial distribution pattern of vulcanizers, examination of location factors as well as the assessment of risks that vulcanizers were exposed to. High resolution imagery (IKONOS) was downloaded and roads of interest were extracted from the imagery to produce a map of the distribution of vulcanizers. Nearest Neighbour Analysis was carried out to determine the spatial pattern of distribution of vulcanizers in the study are. Factor analysis was carried out to extract most manageable factors of location choice, other descriptive statistics were conducted to determine risks factors that vulcanizers were exposed to in the study area. Results revealed that vulcanizers were distributed in a dispersed pattern in the study area given the NNI of 3.489. Also, proximity to traffic, distance from home, nearness to motor park, low competition, high traffic volume and opportunity for shelter were extracted factors which contributed a total of 61.314% of variance explained by the variables. However, traffic noise, exposure to weather condition and dust and smoke formed the major risks that vulcanizers were exposed to in the study area. The study concluded that most roadside vulcanizers were exposed to risks and actions be taken to relocate them from roadside to reduce mortality that may arise from unsafe trade location. Background: The resulting interaction between occupational stress and individual susceptibility to illness demands careful management. This represents a dual challenge to organizations responsible for the well-being of personnel who engage in strenuous physical exertion, imposing requirements to be vigilant for, or even curtail, situations that may result in high physiological strain in healthy personnel and also to identify and protect vulnerable individuals. The emergence of wearable physiological and medical monitoring technologies could prove advantageous in this regard. 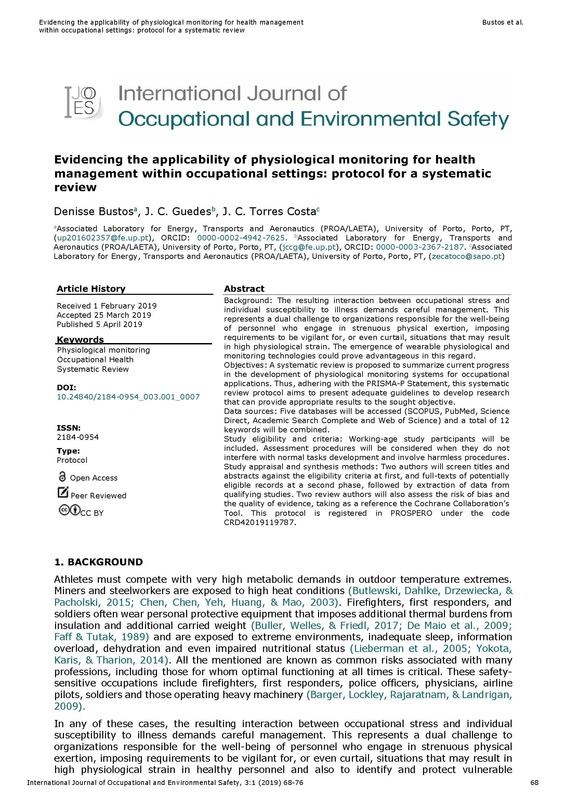 Objectives: A systematic review is proposed to summarize current progress in the development of physiological monitoring systems for occupational applications. Thus, adhering with the Preferred Reporting Items for Systematic Reviews and Meta-Analyses Protocols (PRISMA-P) Statement, this systematic review protocol aims to present adequate guidelines to develop research that can provide appropriate results to the sought objective. 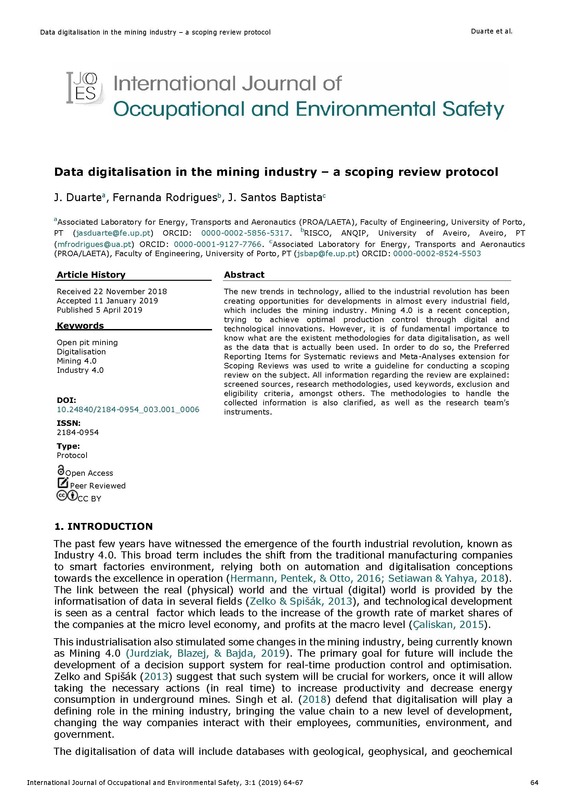 Data sources: Five databases will be accessed (SCOPUS, PubMed, Science Direct, Academic Search Complete and Web of Science) and a total of 12 keywords will be combined. Study eligibility and criteria: Working-age study participants will be included. Assessment procedures will be considered when they do not interfere with normal tasks development and involve harmless procedures for participants. Study appraisal and synthesis methods: Two authors will independently screen titles and abstracts against the eligibility criteria at first, and full-texts of potentially eligible records at a second phase, followed by extraction of data from qualifying studies. Two review authors will also assess the risk of bias and the quality of evidence, taking as a reference the Cochrane Collaboration’s Tool.